Is Dunkirk, writer/director Christopher Nolan’s version of one of the biggest military disasters of all time that, somehow, near miraculously, became a symbol of one of the biggest military triumphs of all time, any good? Or does that matter and the movie, at least at this moment in time, is somewhat beyond criticism? 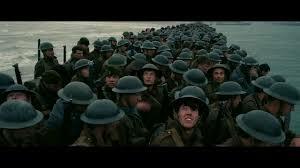 The film is certainly a monumental achievement, but ironically its due to Nolan’s minimalist approach to drama, with little dialog, no backstory and vistas of groups of soldiers lined up along the beach as if they were waiting for a bus. It has one of Nolan’s non-linear timelines with three different stories constantly intercut. 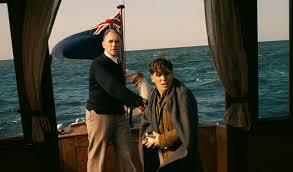 One, a pilot in a British spitfire, takes place over the course of an hour; a second, a man who takes his boat and heads to Dunkirk to pick up soldiers, takes place over a day; and finally, a young soldier and a friend he meets who try to get off the beach any way they can, takes place over a couple of days. These three timelines play in parallel, though they don’t happen that way, until they intersect at a climactic moment before once again going their different timeline ways. And it is ultimately deeply moving as an incredible 300,000 men, when Churchill’s goal was only 30,000, are taken home, not by carriers, but by a flotilla of boats manned by working class, they’ll always be an England boat captains. At the same time, I’m not sure that there is anything special here when it comes to the plot. It certainly gets the job done, but I’m not convinced it does much else. But I’ve always thought of Nolan as a strong director and visual artist, but not as a particularly good story teller. Also released this year is the movie Their Finest, a film about a production company during the Battle of Britain who also made a movie about Dunkirk. As cheesy and corny as that movie within a movie was, the story seemed far more compelling. And because Nolan’s stories have trouble becoming, well, stories, the movie does feel as if it falters and stalls at times. Even the clever structure, by the time everything is over with, I’m not convinced really adds anything that interesting to the story other than being clever. So in the end, though the minimalist approach has its merit, it also somewhat reduces everything to a spectacle that is somewhat safe, bloodless and even antiseptic. But it must be said, the film does work and it often works very well. 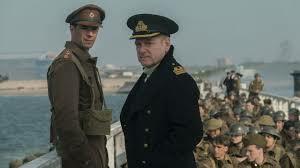 With Kenneth Branagh as the head of the army at Dunkirk; Mark Rylance as the captain of a fishing boat (and few can play stiff upper lip better than Branagh and Rylance); Cilian Murphy as a soldier suffering shock; and Tom Hardy as a pilot. Lately there seemed to have been a number of stories dealing with WWII. The television series The Crown, about the reign of Queen Elizabeth II, begins during the war; the aforementioned Their Finest, about a group of filmmakers working during the Blitz; Churchill, with Brian Cox as the great man agonizing over D-Day; Darkest Hour, with Gary Oldman also as Churchill; and The Imitation Game, with Benedict Cumberbatch as Alan Turing (and that’s only a few). I don’t know whether there is something psychological going on here, a wish on artists and audiences’ parts to return to a time that seemed simpler when it came to right and wrong and where everyone was united, or whether it’s all coincidence-after all, it takes so long to get a movie made, the idea of a zeitgeist going on here may be premature.